The above template displays a diagram of black barrels of oil by a colorful bar graph with an arrow. This image signifies business concept. This image has been conceived to enable you to emphatically communicate your ideas in your Business and Financial PPT presentation. Our PPT images are so perfectly/ideally designed that it reveals the very basis of our PPT template to make your clients understand. Mastermind plans with our Oil Barrel With Finance Graph Industrial PowerPoint Templates And PowerPoint Themes 1012. Download without worries with our money back guaranteee. 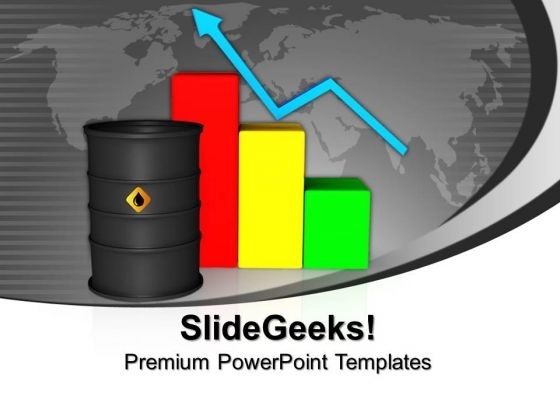 Exclaim to the world with our Oil Barrel With Finance Graph Industrial PowerPoint Templates And PowerPoint Themes 1012. Advertise your ability to everyone around.